Get more active and start feeling better — for the rest of your life. Help prevent cancer, heart disease, diabetes and other chronic illnesses. How much do you need? You choose! Move your way: in a few 10-minute sessions a day, half an hour daily, or a 2½ hour weekly workout. Everything you do adds up. Plus: At least twice a week, choose an activity that helps strengthen your muscles. Get the same great benefits in half the time with a vigorous-intensity workout. Anything that gets you moving. Active hobbies: Running, bicycling, swimming, hiking ... you name it! Look for opportunities in the things you do every day, or start a simple daily exercise routine indoors or outdoors. Brisk, steady activity is all you need to do good for your body. Busy? Check out these tips to put more movement in your day. Your breathing will tell you! Moderate intensity: You are breathing harder, but not enough interfere with conversation. Vigorous intensity: You need to take a breath every few words. Bonus: Vigorous activity means you can reduce your exercise time by half and still get the same health benefits. Fact sheets to print and keep. 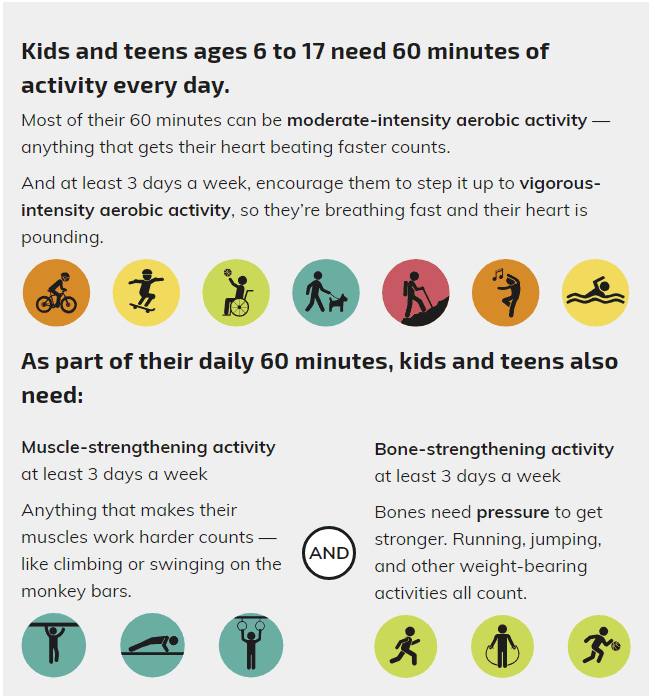 When kids build a habit of being active every day, they benefit for life.